TWENTY years ago Pope John Paul II visited Australia for the first time, from November 24-December 1, 1986. He arrived in Brisbane at the QE II Stadium on November 25. Before Mass he addressed the handicapped, sick and disabled people as well as representatives of the media, then the catechumens during Mass, and afterwards at City Hall, the people of Brisbane. His visit was an exciting experience later to be repeated in other cities of Australia. Nevertheless, the greatest impact made by the pope in his short visit to Australia happened when he delivered his speech to the indigenous people of Australia at Alice Springs on November 29. There, much to the discomfort of some Australians, he reaffirmed the unique importance of the indigenous people of Australia, and proclaimed that God’s Holy Spirit had been with them from the very beginning of their existence. “For thousands of years,” he said, “you have lived in this land and fashioned a culture that endures to this day. And during all this time, the spirit of God has been with you. 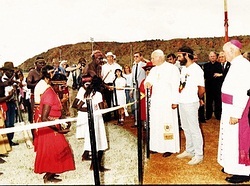 This remarkable interest of Pope John Paul II in the indigenous people of Australia was repeated many times over on my later ad limina visits to the pope in Rome. Again and again he marvelled at their antiquity and the fact that the Holy Spirit had moved over them thousands of years before the same Spirit moved over Abraham and Moses. Little knowing how significant his visit to Alice Springs would be, I journeyed there with a number of other bishops for the occasion. Bishop Ted Collins of Darwin hosted the pope’s visit and was our leader as we greeted the pope on the tarmac at the airport. Later still on the journey to Blatherskite Park where the indigenous people had gathered, the popemobile overheated, causing the pope to be transferred briefly to our own bus carrying bishops, politicians and officials. As he usually did on such occasions the pope sat quietly praying until the problem had been solved. He then returned to the popemobile and our journey continued. After mixing freely with many thousands of indigenous people at the park, most of whom had travelled long distances to be there, he delivered his memorable speech. With vestments flapping, and dust swirling around him he doggedly finished his speech, saying afterwards to Bishop Collins, “They may not have heard my speech but at least they will be able to read it after my departure”. He could not have possibly realised the joy with which the speech was received by the indigenous people, and has been received ever since. Again and again his words have been quoted on a thousand different occasions, so that it is entirely proper that the pope’s visit and speech should be celebrated again on its 20th anniversary this year. Planted forever in our Australian psyche, his visit and speech will forever remain a significant event in the long struggle of the indigenous people of Australia for full recognition. More than anything else, the pope’s speech has made us all aware of the absolute need for the inclusion of our indigenous brothers and sisters at all levels of Australian society if Australia is to become the nation that God wants it to be. After his remarkable address and his friendly contact with the people, the Pope eventually departed Alice Springs for Adelaide after his plane had been delayed for over an hour by a severe storm. Dressed in white soutanes and red sashes, the bishops waited with journalists and officials around the airport bar, no doubt presenting an interesting spectacle for the assembled media. In 1996 I asked the pope at a Vatican dinner in the presence of other Australian bishops if he still remembered how in 1986 he had travelled from Melbourne, to Darwin, to Alice Springs, to Adelaide in a single day. With typical humour he put his head in his hands and whispered “O my God”. He had not forgotten. Fortunately my visit to the centre of Australia did not finish with the departure of the pope. By accident rather than design I was invited to go down to Uluru with a carload of indigenous people from Mt Isa. Initially total strangers, in the two days together we became close friends. One of them, Arthur Peterson, an elder spirit man from Mt Isa, whose grave I visited in Mt Isa in 2005, spoke frequently and affectionately of a “Father Lord”, whom I thought at first was some mysterious priest, only slowly to realise that he was speaking with remarkable familiarity of God, as he would of a close friend. When we arrived at Uluru, Arthur blessed the pool at the base of Uluru, swept away the footsteps around it, informed the local elders that he had done so, spoke comfortingly to a disturbed crow in a surrounding tree whom Arthur said was the guardian of the pool, and then with a branch of gum leaves sprinkled water on myself and a group of surprised American tourists who happened to arrive that very moment. On the trip to Uluru and back I came to realise the shyness of my companions as we stopped at service stations along the road. On those occasions I experienced, if only a little, their sense of alienation as they moved gingerly into what they seemed to regard as someone else’s world. As well as this unease, I learned about their remarkable relationship with nature as we passed through unexpected hailstorms that covered the red earth with snow-like hail, both on the trip to Uluru and on our return. As we approached Alice Springs we could see from a distance a huge, thick, half rainbow that seemed to be grounded close to where we judged Alice Springs to be. To our utter surprise when we eventually arrived we saw that it was grounded over Blatherskite Park where the pope had been only two days earlier. No indigenous person in the car spoke about these natural phenomena, whether about the dust storm at the park, the rain storm afterwards, the hail storms later still, and finally the rainbow. They seemed to be able to discern meaning in the events that needed no comment. I’m sure however, if I had asked Arthur about them, he would have explained their significance to me in a way that as a non-indigenous person I would probably not have been able to understand. Next day, as we departed to return to our respective homes, I realised that the 1986 visit to Alice Springs would forever remain in my memory as one of the truly significant events of my life. Much of it I could understand, but even more will forever remain a mystery to me. The trip certainly made me much more aware of Pope John Paul’s love of all people, his empathy with them, and his passion for justice. But equally as important as this understanding of Pope John Paul II was my deeper understanding of the indigenous people of Australia and their remarkable sense of the sacred. Only in more recent years have I realised that my decision to go to Alice Springs in 1986, in my first year as a bishop, undoubtedly under the inspiration of God’s Holy Spirit, proved to be one of the great decisions of my life.